I love road travel, partly because I get to visit towns with weird names. I’ve driven through places like Shamrock, Yeehaw Junction, and Two Egg — and those are just towns in my home state of Florida! There are all kinds of interesting towns throughout the United States. I thought I’d share some stories on 10 unique places with weird names. This small town in Nebraska was established in 1886 at the end of a rail line. Today, Hazard has a population of around 70 people, all whom live in a village that’s about a 1/4 square mile in size. Not much goes on in Hazard, Nebraska, but it does have a place in pop music history. Singer Richard Marx (the guy who sings the 1989 hit “Right Here Waiting for You“) released a song called “Hazard” in 1992. The song is rather dark and talks about a woman named Mary who goes missing. The town thinks the narrator has something to do with her disappearance. Cape Disappointment is a headland in Washington state forming the northern part of the mouth of the Columbia River where it meets with the Pacific Ocean. Cape Disappointment’s claim to fame is that it’s the area where Captain Meriwether Lewis and Second Lieutenant William Clark and their Corps of Discovery saw the Pacific Ocean in 1805. However, Lewis and Clark aren’t the individuals who gave this beautiful spot in Washington its sorrowful name. Naming honors go to English explorer John Meares, who in 1788 passed through the area after missing the entry to what would later be called the Columbia River. The area today is home to Washington’s Cape Disappointment State Park. There’s a whole lot of nothing going on in Nothing, Arizona. This place, now a ghost town, along U.S. Route 93 in Arizona was established in 1977 and at one point had a gas station and convenience store. It’s located about 100 miles northwest of Phoenix, Arizona. 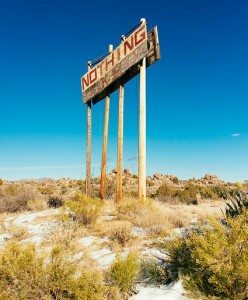 Town of Nothing Arizona. Founded 1977. Elevation 3269ft. The staunch citizens of Nothing are full of Hope, Faith, and Believe in the work ethic. Thru-the-years-these dedicated people had faith in Nothing, hoped for Nothing, worked at Nothing, for Nothing. After attempts to revive the outpost around 2008, the town of Nothing, Arizona, still has nothing going on. The small community of Monkeys Eyebrow in northwestern Kentucky got its name in the early 20th century by individuals who thought Ballard County, where Monkeys Eyebrow is located, looked like a monkey’s head on the map. The community is located right about where, on the map, it would appear the monkey’s eyebrow could be situated. While there may not be many monkeys in Monkeys Eyebrow, there are some community connections to at least one very famous (and very rich) duck. Deadman Crossing is a tiny community in Ohio about 50 miles south of Columbus. The town is centered around the intersection of 3 Locks Road and Toad Hollow Road near the Scioto River in Ross County. Deadman Crossing is about 5 miles southeast of Chillecothe, which boasts a population of more than 21,000 people. 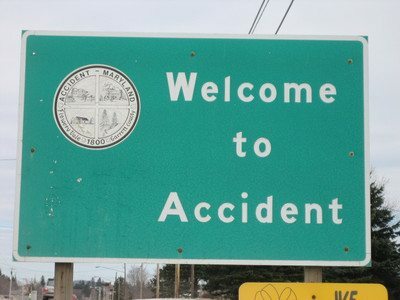 The founders of Accident, Maryland named their town that on purpose. This small town in far western Maryland has a population of about 320 Accidentals — that’s what people from this town are called. The town came to be during the late 18th century, with 50-acre lots going to military veterans from Maryland who served during the War of Independence. While the town is in Maryland, Accident is considered to be part of the Pittsburgh, Pennsylvania, media market. They say they do things a little bit differently on the West Coast, and apparently that comes to naming towns, too. You have to wonder who would live in a place called Idiotville. At this time, nobody does. It’s now a ghost town. In 1977, a nearby stream was named Idiot Creek. The small town, once a logging camp in the Tillamook State Forest, was so named because the spot is so remote from any other signs of civilization, it was said that only an idiot would choose to work there. Just a couple hours to the east of Idiotville, Oregon is a place called Boring (where do they come up with these names?). Actually, Boring is named after an early resident named William H. Boring. He was a Civil War veteran who fought for the Union and moved to Oregon in the years following the domestic conflict. Incidentally, Boring’s sister city is a town in Scotland called Dull. I sincerely hope someday to visit both Dull and Boring. Talk about towns with weird names that have pop culture connections. 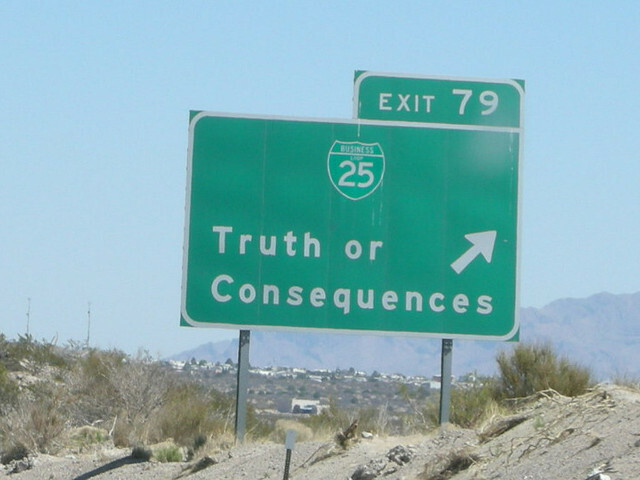 The town of Truth or Consequences, New Mexico is named after a very popular 1950s game show. The story goes that Ralph Edwards, who hosted the radio version of “Truth or Consequences” in the early 1950s, promised to air the hit game show from the first town that named itself after the show. A small New Mexico town called Hot Springs stepped up and did the deed. There’s no name I’d rather save for last on this list than, you guessed it… No Name. 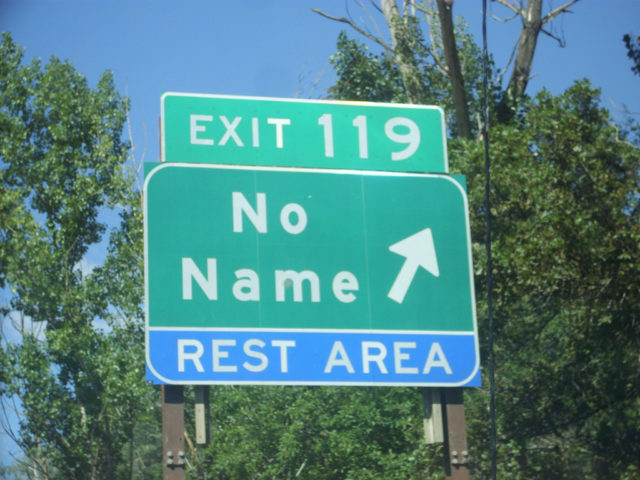 Why “No Name”? Why not, say, “Nothing”? 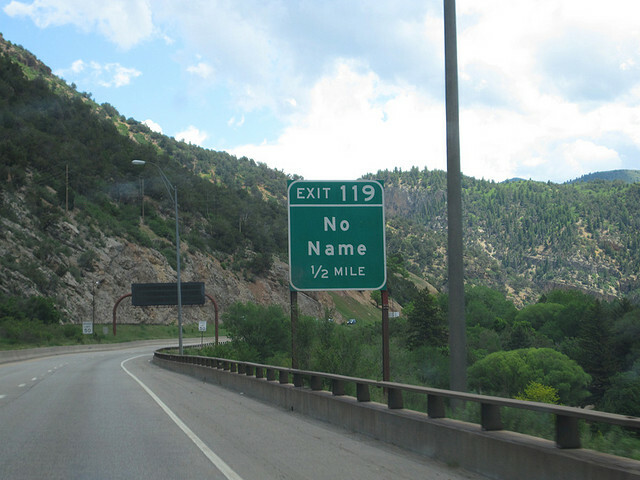 Well, as it turns out, the developers who plotted Interstate 70 through this region of Colorado built an exit right where No Name is today. There was just one problem: the exit led to nowhere. There was no town there! Even years later, when civilization entered the area, the name stuck. And the place is still called No Name today. There’s even a No Name Tunnel along I-70 nearby.